Pistachio (Pistacia vera) is a horticultural tree grown for its edible seeds. It is of great commercial importance for Turkey which is one of the main global producers. Pistachio trees are mostly cultivated in the Sanliurfa, Siirt, Gaziantep and Adiyaman provinces in Turkey. In recent years, symptoms regarding leaf scorch, chlorosis, and small leaves and significant yield loss have been observed in pistachio orchards. Leaf samples were collected from symptom-bearing (Figs. 1-2) and symptomless pistachio trees in different pistachio orchards. Total nucleic acid was extracted using a CTAB-based method from each sample. Nucleic acids were tested with two-round PCR using P1/P7 primers in direct PCR followed by R16F2n/R2 primers in nested PCR to amplify the 16S rRNA gene (Duduk et al., 2013). Nested-PCR amplicons of approximately 1.2 kb were obtained from all symptom-bearing samples but not from symptomless ones. Amplicons were purified, cloned and sequenced directly in both directions and sequences assembled and compared to reference strains using MEGA7 software (www.megasoftware.net). One representative isolate (2H2EF9) sequence was deposited in GenBank with the accession number MH088869. The isolate showed 99% identity to 16SrXII group phytoplasmas according to BLAST analysis. A computer-simulated RFLP analysis using 17 restriction enzymes with iPhyClassifier (Zhao et al., 2009) and a phylogenetic tree generated by MEGA7 using the neighbour-joining method, confirmed the identification (Fig 3). The association of phytoplasma (16SrI group) and pistachio was first reported by Marzachi et al. (1999) in Italy. There are also reports of phytoplasmas associated with distinct 16Sr groups infecting pistachio in Iran (Ghayeb Zamharir & Mirabolfathi, 2011), and Ghayeb Zamharir (2016; 2018) reported the presence of 16SrXII (associated with scorch disease) and 16SrIX groups of phytoplasma in Iran. 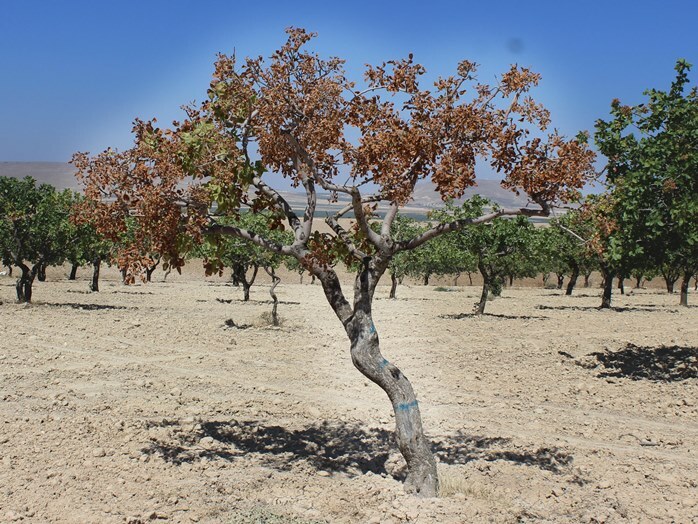 Similarly, we detected and identified phytoplasmas in pistachio trees expressing leaf scorch symptoms in Sanliurfa, Turkey. To the best of our knowledge, this is the first report of 'Ca. P. solani'-related leaf scorch disease of pistachio in Turkey. Since the phytoplasmas belonging to subgroup 16SrXII-A have an extensive host range, mixed farming in the region may, therefore, have a potential threat to pistachio. The distribution, epidemiology and impact of the disease on pistachio yield are currently under investigation. 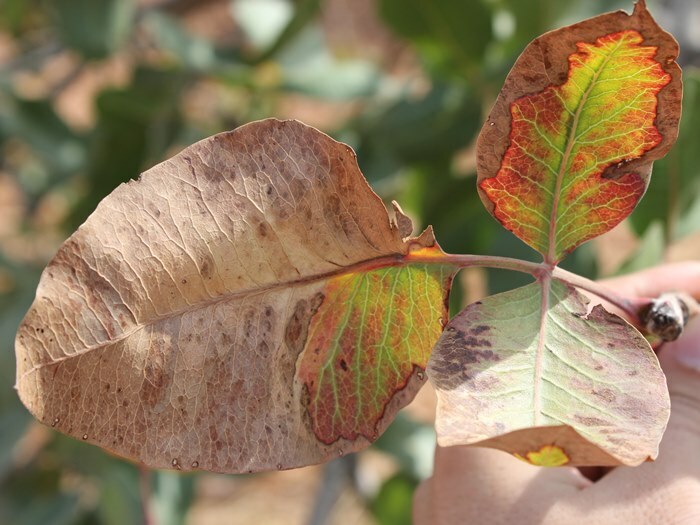 Figure 1: General view of leaf scorch disease on pistachio caused by a strain related to 'Candidatus Phytoplasma solani'. Dry leaves remained on the shoot. Figure 2: Pistachio leaf showing severe reddening symptoms between green leaf veins. 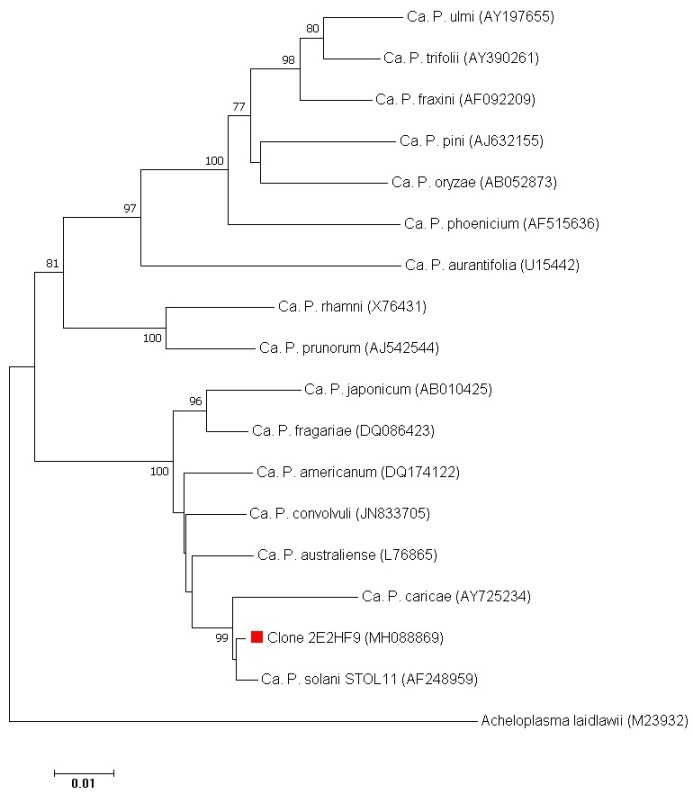 Figure 3: Phylogenetic tree of partial 16S rRNA gene sequences from 18 phytoplasmas including 'Candidatus Phytoplasma solani' associated with pistachio leaf scorch (2E2HF9) and Acholeplasma laidlawii as an outgroup. GenBank accession numbers for phytoplasmas in parentheses. Numbers on branches are bootstrap values of 1000 replicates. The authors would like to thank HUBAK (Harran University Scientific Research Institution) for financial support.